Being able to direct a horse with my gaze is one of my most important long-term goals in training. This enables me to get rid of using body language in a menacing way, and exerting pressure with the riding crop or a rope. What is more, it still allows me to convey precise information. In general, horses communicate in many different ways with each other through eye contact, the direction of their gaze, and body language. I try to simulate this form of communication with my exercise called gaze target. 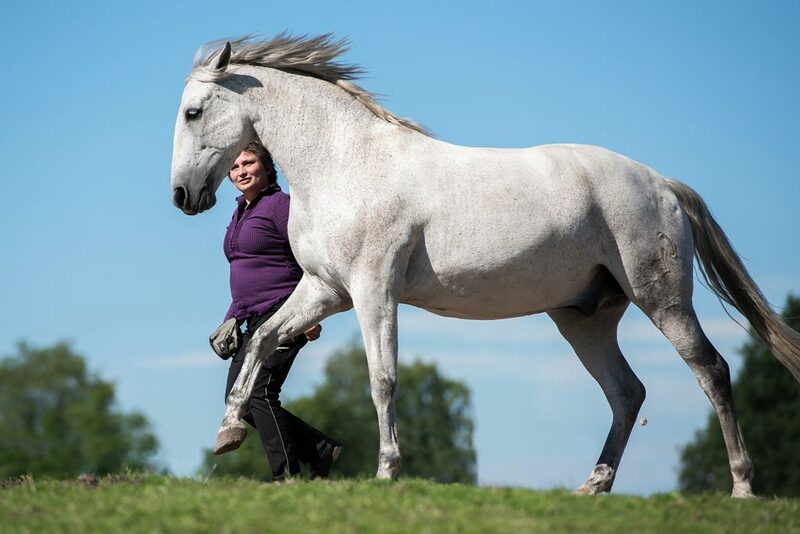 The Arabian horse Walesco and his favorite human being Andrea demonstrate in the following seminar video one possible approach that allows getting a first impression of the gaze target’s workings. 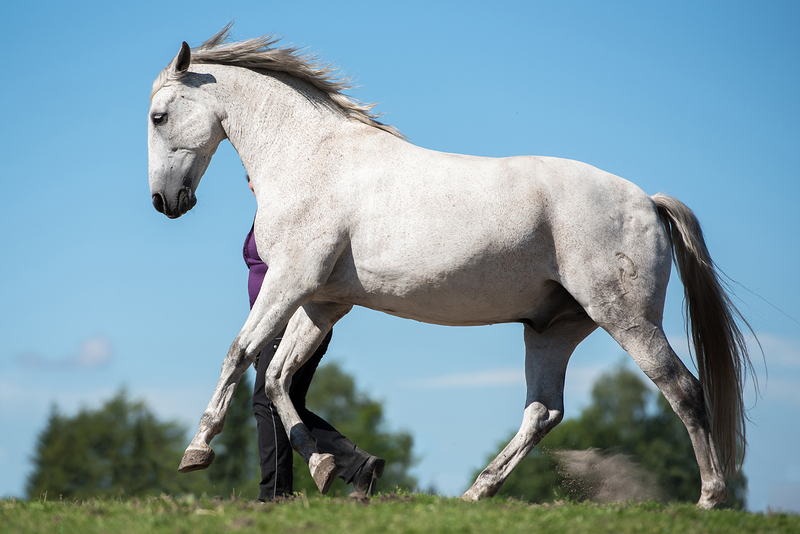 In clicker training the term “target” generally refers to any target that tells the horse to orient parts of its body towards the target, to move in the target’s direction, or to touch the target at a certain spot with a specific part of its body. The target is established in training through rewards, and the horse receives treats every time it approaches and touches the target. From this point of view, it is an alternative approach to the aids used in traditional horse-riding. A horse will try to avoid the riding crop or the threat of a rope. Yet, a target represents pleasant feelings and is approached voluntarily. So, the target becomes an object that evokes positive associations, and has a strong pull. Real objects like ground mats, stationary targets or portable target sticks can serve as classical targets. It is possible, however, to create invisible targets with our eyes for more experienced horses. In a first step, our trainings partner learns that a specific form of eye contact establishes a bond between horse and human. 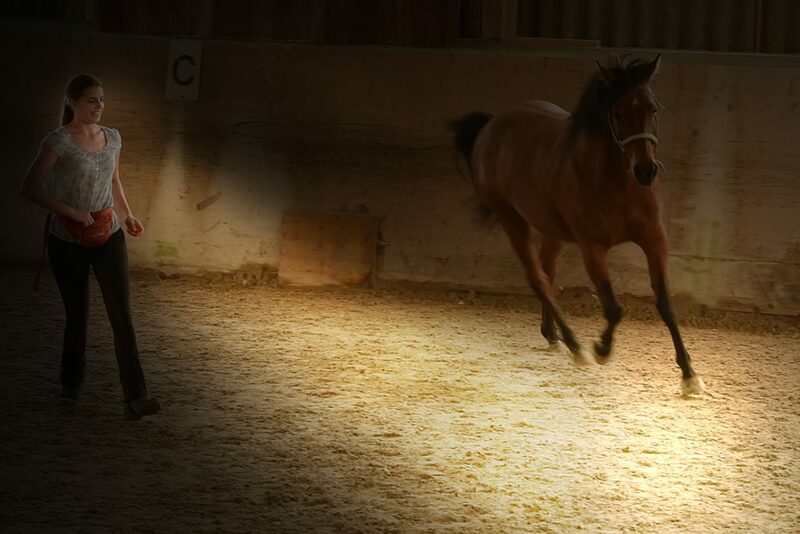 Second, the horse learns to understand the space we “illuminate” with our gaze as target for its own movement. So, the gaze target allows the horse to develop a clear conception of space, direction, and speed; and we are able to increasingly fine-tune our nonverbal communication by the means of our gaze alone. It is possible to coordinate a great variety of intentional movement in space, and to work on challenging riding figures like voltes or circles in any pace. Most horses intuitively react to establishing or letting go of eye contact because it is part of their innate way of communicating with others. I like to describe the gaze target as illuminating an imagined trail so it is possible for us as human beings to become more aware of this form of communication. So, I imagine that my eyes are like little flashlights which send out a bright beam of light. This light beam illuminates the way my horse should walk, and I mark and reward my horse as soon as it walks into the imagined light beam. 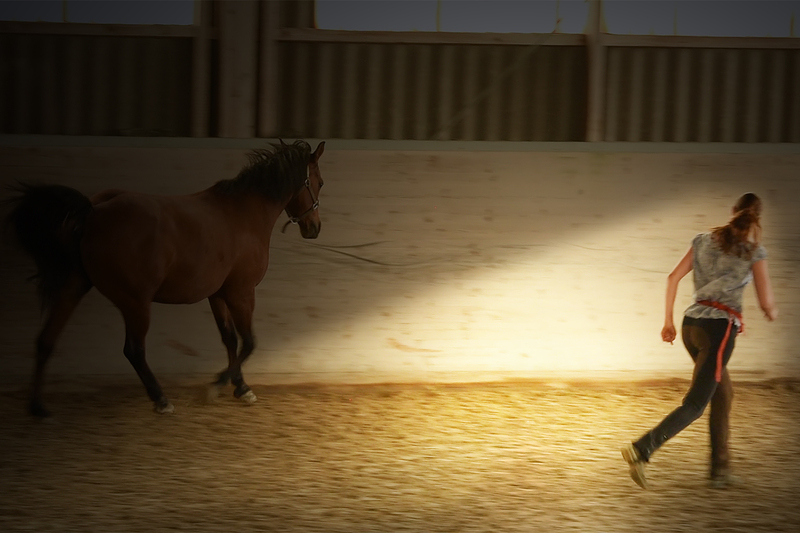 Andrea and Walesco are very experienced already in differentiating between the different gaits and pace of their movements. In our seminar we now want to work on the aspect of direction first, so that we are able to develop precise riding figures later. Working on the gaze target also means working on one’s own capacity to focus. Horses generally understand the principle rather quickly. However, it is frequently more difficult for us human beings to know exactly when we are looking at our horse in which way, and how to use our eyes as signals for communication. To direct a horse with my gaze, I myself prefer to establish intensive eye contact for a short amount of time, directly look at the horse, half-close my eyes, and then turn my eyes to look at the trail I imagine to direct the horse’s movement. Of course, this first target needs to be close to the horse’s original position in the beginning. I click anytime the horse turns towards the imagined light beam, moves in the right direction, or enters the area I illuminate in my mind. 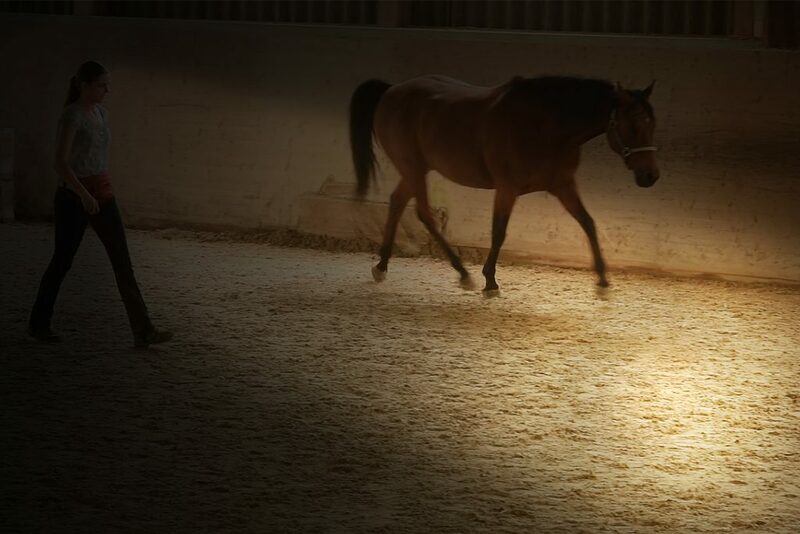 Depending on the sequence of exercises, the general direction, and the pace of movement this illuminated area always moves in different speeds in front of the horse. It is important to not stimulate too much, and to not make too tight turns in the beginning. Yet, our focus should be on having fun – on smiling, petting, rewarding, and on all that builds the relation, and establishes a common focal point. Especially when moving more quickly, and when temperatures are hot like in the video, it is also really important to take the time for breaks, and to enjoy the moment; to experience true moments of well-being that allow horse and human to regain their strength for the next attempt. This also helps the horse to understand our different forms of eye contact. There are moments when we lovingly gaze at our horse, and when our eyes do not signal a certain behavior we want it to perform; and then there are other moments when our eyes illuminate a glittering carpet, and we invite our horse to dance on it.